Toyota’s Prius automobile is world-famous for its efficient combination of a gasoline engine and an electric motor. I recently learned that the efficiency of an ice cream bar can be improved through a similar hybrid technique. A major advantage of an ice cream bar is that it can be coated in sweet substances such as chocolate. But you can’t pick up a chocolate-coated ice cream bar with your fingers. Up until now, the state-of-the art solution to this problem was to use a wooden stick as a handle. However, ice cream bars have to be individually wrapped for shipment and sale. Approximately one-third of the space inside the wrapper goes to waste. It contains nothing but stick and air. A product from Japan’s Lotte confectionery company solves this problem by combining an ice cream bar with a treat that you can handle with your fingers – namely, an ice cream sandwich. Some readers commenting on this post have alerted me to the fact that this isn’t necessarily a Japanese invention. Scroll down to read what they have to say about products already using the same concept elsewhere in the world. 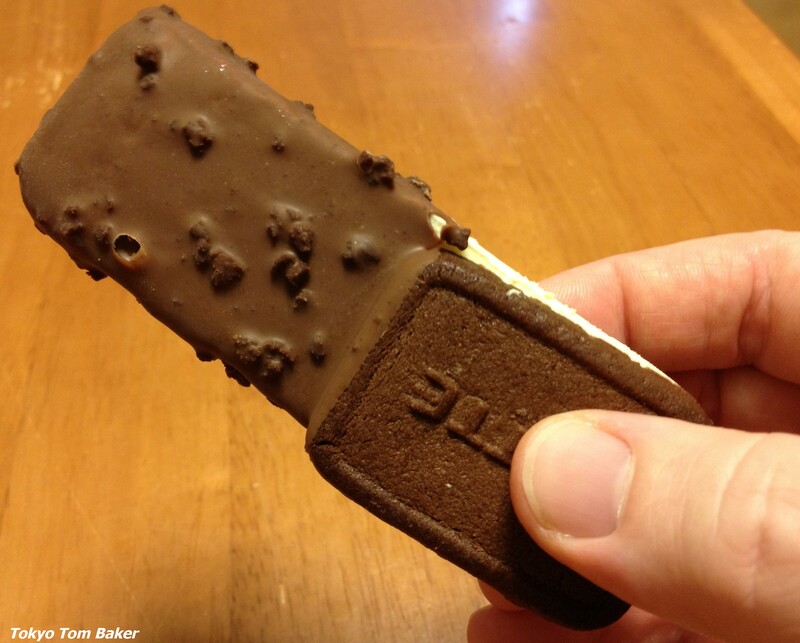 Anyway, the construction of this frozen treat allows you to nibble your way down a vanilla ice cream bar coated in bitter chocolate that is studded with crunchy cookie crumbs – and when you get to the end, you’re left holding not a stick, but a petite ice cream sandwich between two little chocolate cookies. 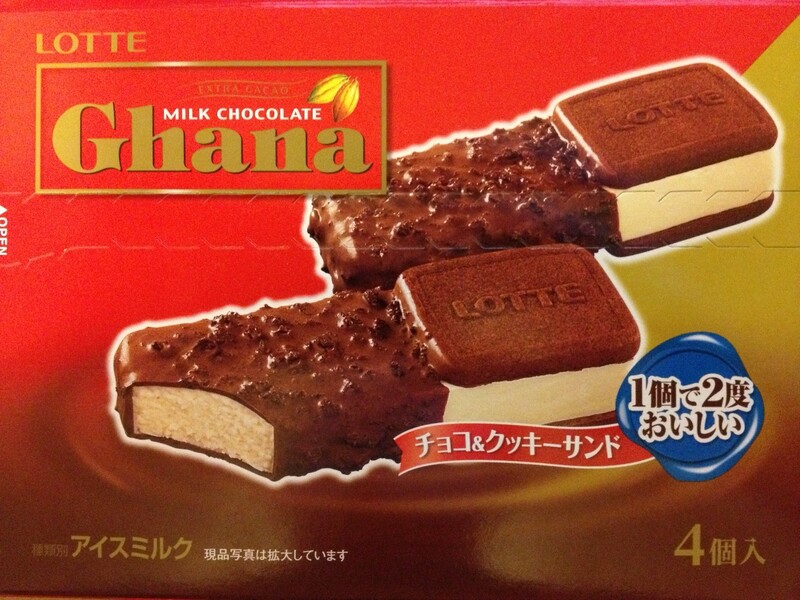 Lotte sells this under its Ghana brand, using the slogan “ikko de nido oishii” (delicious two ways in one piece). I recently purchased a box of four for 298 yen at a grocery store. They are sold individually at convenience stores for a somewhat higher price. As ice cream novelties go, this is probably a fairly green one. No trees are killed to make sticks, there’s less post-consumer waste, and their carbon footprint is likely reduced by the fact that they pack (and therefore ship) more efficiently. But here’s a note of caution to greedy ice-cream lovers: This treat is narrower than a conventional ice cream bar, which means that you aren’t getting more ice cream. Instead, you’re getting the same amount of ice cream delivered in a technologically sleek way. In other words, ice cream engineers were not the only ones involved in developing this product. A supporting role was played by ice cream accountants. You are currently browsing the Tokyo Tom Baker: The Blog blog archives for October, 2012.